You have come up with a brilliant product idea, you’ve drawn and described it, and you’ve searched every nook and cranny for it in the stores and on the Internet. If you discovered that your product is already “in use,” then breathe a sigh of relief and start working on your next brilliant idea! But if you did not find your product on the market, then you have a decision to make: to go to the next exploratory level – the preliminary patent search – or not. The answer may not be as obvious as you think. Some inventors lose interest in their ideas after they’ve completed the market search; to those among you, cut loose here and see if you can come up with a product idea that really lights your fire. If you’ve got the old idea switch on, “the one” will appear eventually. 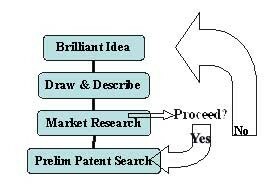 Invention Process Chart 1 For those ready for the next level, prepare for a time-consuming, but enlightening necessary step: the preliminary patent search. But first, let’s put some more flesh on your idea. Go to the place where you do your best creative thinking. I take myself on over to my favorite Starbucks® and sit myself down in a big cozy chair with a hot cup of liquid speed, my lucky Big Red orange pen, and my inventor notebook. Inventors are a ritualistic bunch. Then draw and describe your object from scratch, reflecting any changes affected by your market research. Write down every function (verb), every possible name for (noun), and every adjective that describes your idea… and synonyms for those words. These will become the key words used for your Preliminary Patent Search. The United States Patent and Trademark Office (USPTO) is the government agency responsible for awarding commercial rights to intellectual property, including trade and service marks, and (ta-da!) inventions! For a patent to be awarded, the USPTO must find the invention to be original to the applicant, not made obvious by previous patents, and not already in the public domain (e.g., ways to decorate a Christmas tree). The patents were available through an internal data base of the USPTO. 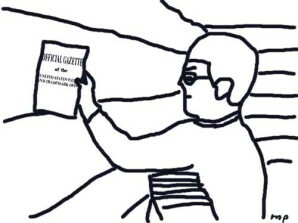 The computer search provided basic information about each patent; if you wanted to see the whole patent, you had to look it up in the issue of the Office Gazette of the USPTO where the patent was first published. If the library didn’t have the text in hard copy, you would have to order a microfiche of the entire patent... and wait for a librarian to obtain it for you. Nothing compares to the interminable boredom of doing a patent search this way. While it may take more time to do a search at the depository, the method is more thorough than searching on the USPTO website, online since 1998. I’m going to assume that you would prefer to do your search online. So you don’t waste too much time trying to figure out which set of directions to follow, I’ll try to direct you to the most useful pages. But first, here is your mindset: Just like you played detective when you looked for your product on the market, you need your Sherlock now so you can find your patent! If it’s out there, you want to know. The sole purpose of this search is to see if your idea has already been patented by someone else; you are not trying to determine if your idea is patentable. First, thank you Mr. Brown for pointing out my error: copyrights are under the auspices of the Copyright Office not the United States Patent and Trademark Office. I will correct that in the article. Relevant to the additional comments made by Mr. Brown, most readers recognize that my columns are written for new inventors. The information I provide about the process of invention is not laden with terms of art, but of general usage and understanding, so as not to overwhelm the reader with technicalities that are not meaningful at a particular time. Additionally, each column is one of a series, and in this case, I chose to end this column at round one of the preliminary patent search. Mr. Brown points out that there is more to the preliminary search.... Yes, there is; that's why I write that the information they have obtained "is not conclusive." However, as my readers will see, in my next column, I'm going to suggest a somewhat different path. Old out-dated patents are now fair game! Previous out-dated patents can be used in creating a unique combination for a new an patentable invention! Even already (less than 17 year) patents can be used if they have been licensed. Such as a licensed patented paint can be used in conjunction with your new car type of invention without infringing the patent on the new type of paint. First, searching at a depository is not at all more thorough than searching on the USPTO's website - if anything it is simply less efficient. Searching using the search methods typically used at depositories are simply much more thorough than searching for two "keywords" within patent abstracts. Searching within abstracts will limit irrelevant results, but in many cases will still give you a lot of irrelevant results while failing to locate many relevant results. Even if you search multiple combinations of keywords, you will still pull up more irrelevant results while failing to locate relevant ones - there are likely to be many patents on related subject matter that are irrelevant to you, and additionally, patents often use different language to describe things than would commonly be used. Plus, there will also be occasions when a patent is extremely relevant but that would not be indicated by the abstract. Sorry to go off on that tangent...but the point I was getting at was, if you do plan to do it yourself and you are willing to invest a good amount of time in to searching patents, as with anything else, at least do it as right as you can. In this case, at the least, it means learning a little bit about the patent classification system, as well as learning a little about the boolean search options available to you at the USPTO's site or at any site you choose to use instead. But, I would agree that doing it yourself will generally be a much better value than using a cheap, lower quality search service. And even in other cases it just might make sense for you. My experience, its not uncommon to come across inventors who claim they've done their research and may be convinced that nothing similar exists. Unfortunately, in those cases, it doesn't always take more than 10 minutes to show them otherwise.